We’ve been empty nesters for about three months now. There are lots of little differences, mostly positive however one of the biggest adjustments has to do with our evening meal. I know how to cook for a family; in fact I never did really cook until I had one. So, after 30 years it’s back to two of us and all our favorite recipes serve at least four. I know there are great recipes out there for two people, but I’m not really excited about continuing to cook anyway. I cooked to feed my children and now that job is done, I want to scale back. I’m usually working at least part of every weekday evening on one of my blogs so we’re switched to quick meals using these changes. Trader Joe’s has great pre-made entrees that are smaller sized. For only $5-7 we pick up a lasagne or meatloaf and with a couple of sides have a great-tasting meal and leftovers for lunch the next day. We sometimes buy frozen meals that need minimum preparation but easily serve two people. Even though buying in bulk is cheaper per measuring unit, it wastes money if the food goes bad. So, we’ve shifted to smaller packages of products. 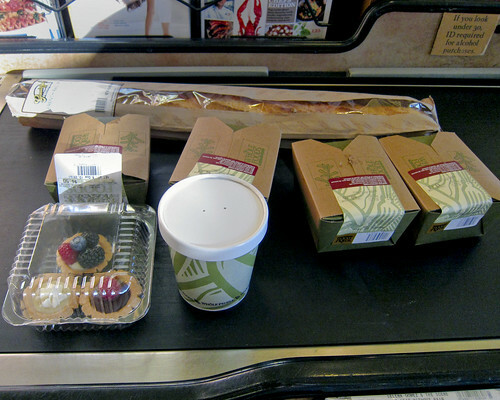 Fresh and Easy is a new favorite store because they offer meats packaged for two people. I love to buy the stuffed pork chops or chicken breasts for only slightly more than the regular option. Yes, we’re eating out more. But it’s not busting the budget because we are typically using a buy one, get one free coupon. Instead of spending $15 on ingredients for dinner, we spend it at a restaurant. I usually have some left over for a second meal the next day. One of our favorite meals is a roasted chicken from Costco. For only $5, we get a chicken that lasts us at least 3 meals. The first night is warm chicken with sides. The next day we have chicken sandwiches for lunch and entree-size chicken caesar salads for dinner! We still cook our old favorites once in a while, but usually when we have company to help us eat it all or room in the freezer to save leftovers for another day. How have life changes impacted your dining habits? My husband and I are the only two people in our house and it is trickier cooking for two. Mostly, it’s hard to get through all the food before it goes bad! As for Trader Joes, I love their packaged foods, even the individual meals are great in case Mr. LH and I want something different. So though there aren’t any changes around here, I completely understand that you don’t want to cook all the time! We have been empty nesters for 14 years! My wife adapted to the change although the leftovers make great lunches. We eat out twice a week at inexpensive (less than$20-25 for 2) restaurants to give my wife a break. We tend to take out about 75% of the time we eat out. I’m looking forward to this phase already…only 15 years to go. The early years of adulthood and then marriage were filled with new restaurants and looking for different and exciting taste sensations. Having children has sharply narrowed our dining experiences. Our kids are just not adventurous. I’m hoping they will expand their options. There are so many amazing foods to experience. It will be quite a change when the empty nest happens. There will be a lot less noise. Meal preparation will require a lot of adjustment since right now, 5 out of 6 are still home. One is home this summer from college. But having nobody around will be a big adjustment. Some positive and some negative I am sure. Lets hear it for us empty nesters!! YEAH!!! Oh wait, I shouldn’t get that excited…. It is an adjustment – cooking for two instead of four (or not cooking for two as the case is often at our house). I figure hubby is a full grown adult with two hands and a mind and he does quite well feeding himself a couple of times a week – thank you very much! I do experiment a few times a week with new recipes now that the kids are not there to say ‘yuk, what’s that?’. We just replaced our refrigerator with a smaller one!! Yea, very energy efficient. Of course Trader Joes has the best alternatives for great and easy eating!!! It’s just us two, and fortunately we both love to cook from scratch–it’s quite enjoyable. What’s really nice is that I don’t want to cook every night, so it usually ends up that on the nights I don’t want to cook, Paul picks up and is excited about a recipe (actually, truth be told, he cooks more than I do!). It’s also nice that it’s just us two because we can have leftovers the next night. That being said, once every other month or so I LOVE to explore Whole Food’s prepared foods section and bring us home something yummy. In particular, I love their spinach-feta-pecan-strawberry salad and butternut squash crab bisque. Mmmmmmmm:). We’ve had some practice with being empty nesters a few times when we sent the kids to visit family. It’s a little trickier to plan meals, and leftovers play a bigger part. We keep wishing for a Trader Joe’s in our town. My mum still hasn’t adjusted. She went from 7 (5 of which were hungry teens) to 2 kids rather quickly. It has been 2 years and even now she still makes ‘extra’ as it just seems to small in her mind to feed everyone, lol. Mind you, she had years of cooking for a very large family, plus a constant stream of extras. I think your ideas are great. I have always liked to cook, but having kids certainly changed what I cook. I am sure it will change again as they get older and again when they leave home. Previous post: Refinancing Your Home Loan to Save!